Olive wood has excellent properties and has therefore been regarded as valuable material for many centuries due to its warm colouring and honey-coloured grain of the wood. Stainless steel bolsters and blade satinated. A real gem with needle etched double plates on the top and bottom. Blade made of easy-to-sharpen, rustproof Sandvik 12C27 steel. Hardness 56 HRC. Supplied in a wooden case. The Laguiole folding knife is an icon of French design. 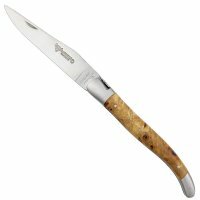 As early as 1829, this knife shape was created in the small mountain village of the same name, Laguiole, in southwest France. 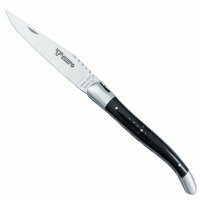 The trademarks of this classic knife are the ergonomic shape of blade and handle, the »bee« stop and the fine engraving on the spring. All Laguiole handles have the traditional »Shepherd's cross« of fine silver ornamental rivets (excluding staghorn handles). Shepherds who spent the summers with their flocks in the Auvergne highlands used to stick the blade into the ground and pray in front of the cross. Feather and bee are forged from one piece and artfully decorated by hand (needle etched), each blacksmith having his own engraving. Note: Pay attention to the origin of the knife when buying. Beware of cheaply produced knives manufactured in China or Pakistan, because the name »Laguiole« cannot be protected. The »LOG« (Laguiole Origine Guarantee) stamp guarantees that the knife originates from the genuine Laguiole area and is produced using traditional methods. 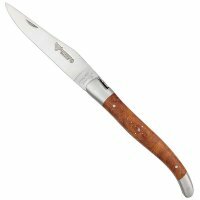 The traditional Laguiole en Aubrac forge is one of the most renowned forges in France. The company is located in Espalion, within the »Laguiole Origine Garantie« zone. Each knife is made by a knife smith and is unique because of its handmade components; depending on the design, up to 216 work steps are necessary. The manufacturer gives a lifetime warranty on material or manufacturing defects. Leather pouch for Laguiole en Aubrac folding knives. Fits No. 718580 , 718581 , 718582 , 718583 , 718584 , 718585 , 718586 , 718587 , 718588 , 718589 , 718590 , 718591 , 718592 , 718593 , 718594 , 718595 , 718596 .